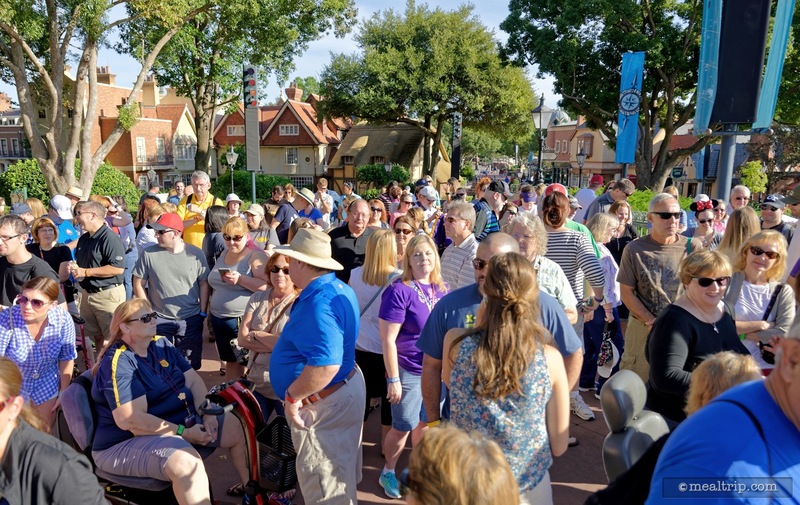 The popular Chefs de France only opens up for breakfast a few times per year, and those days are all during the Epcot International Food and Wine Festival! This popular breakfast has been one of the lower cost special events during Epcot's Annual Food & Wine Festival. It's not uncommon for certain days to be booked out long before the festival begins (i.e. the "first" one of the season seems to book out insanely fast). 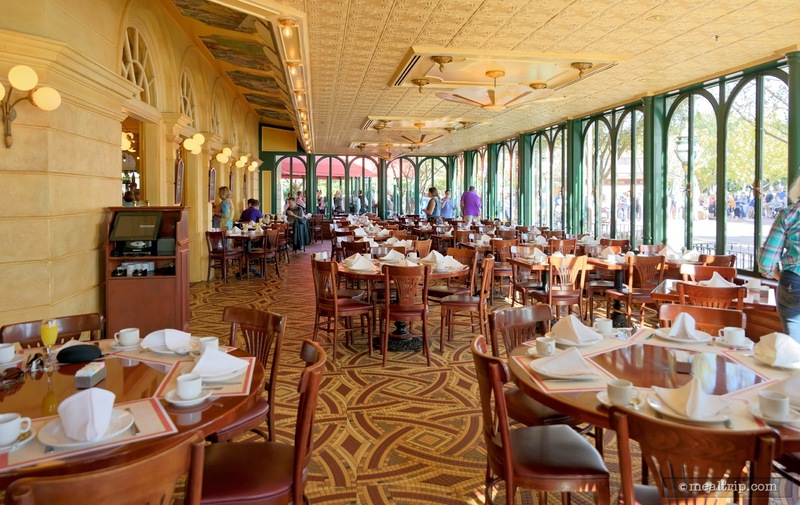 The bright and open Chefs de France location takes on a "Parisian Cafe" vibe during the morning hours. 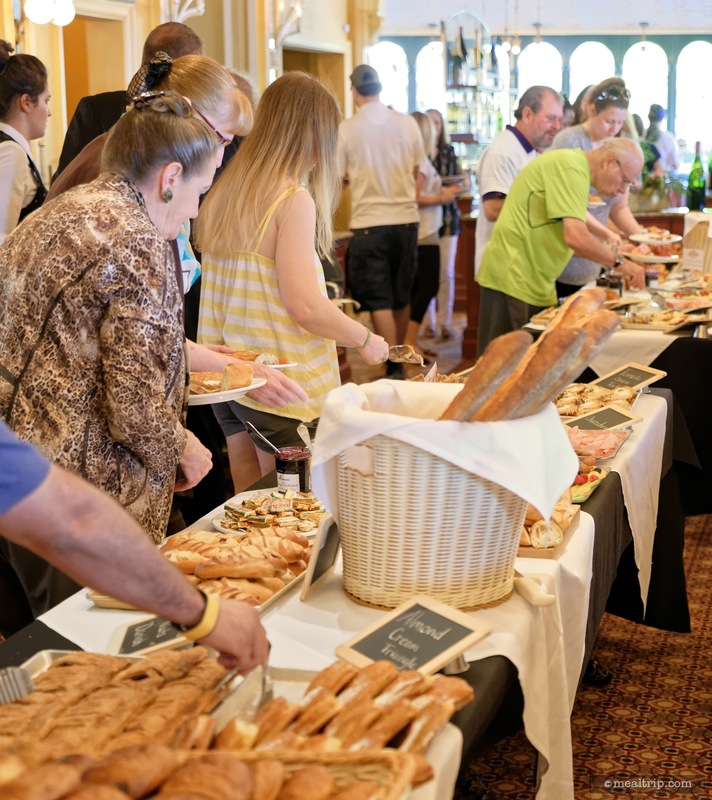 Even though the restaurant is packed full of guests , the space doesn't often feel crowded and there's hardly ever a line at the pastry tables. The main dining area picks up yellow and orange hues from the morning light, and feels very French-country. 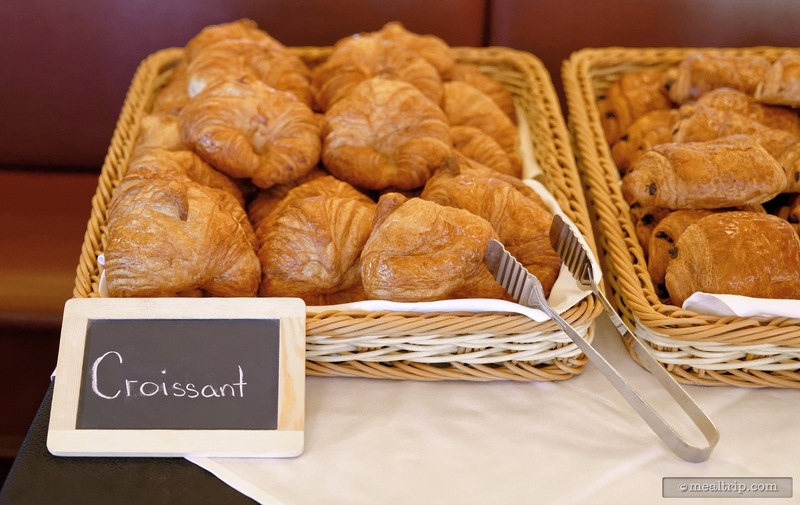 There are quite a few pastries available (buffet-style), along with assorted cheese, meat, and fruit offerings. 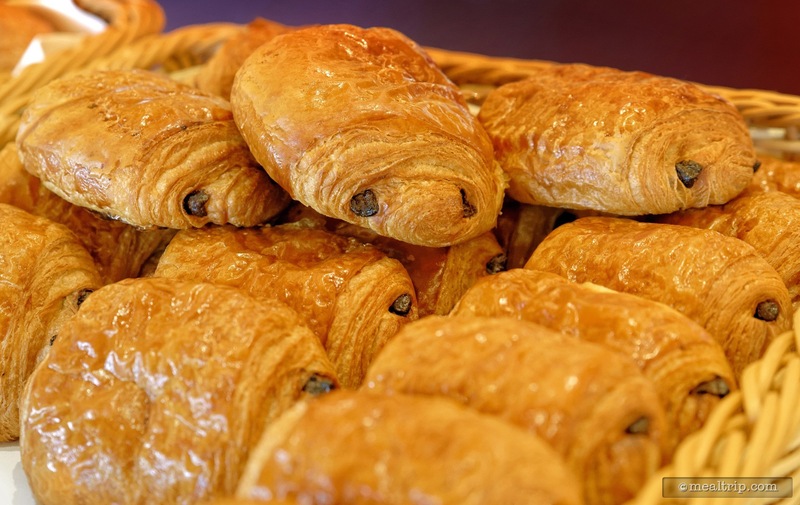 The pastries and baked goods are made fresh hourly at the nearby Les Halles Boulangerie & Patisserie, and they are one of the main "culinary" features of this event. 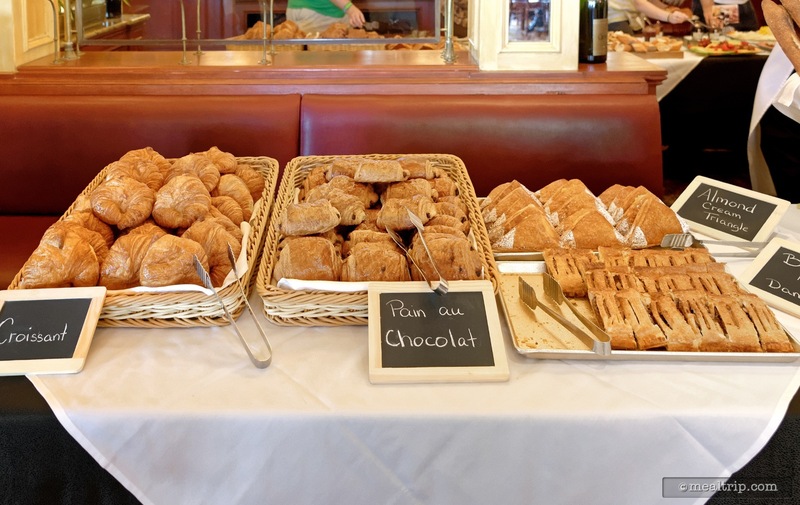 Some of the offerings range from the "simple" (but yummy) croissants (plain and chocolate chipped), to more complex items like the Croque Monsieur, which combines ham and baked cheese on fresh bread. Tables are duplicated on opposite sides of a column, so there's not often a build-up of guests waiting in line. 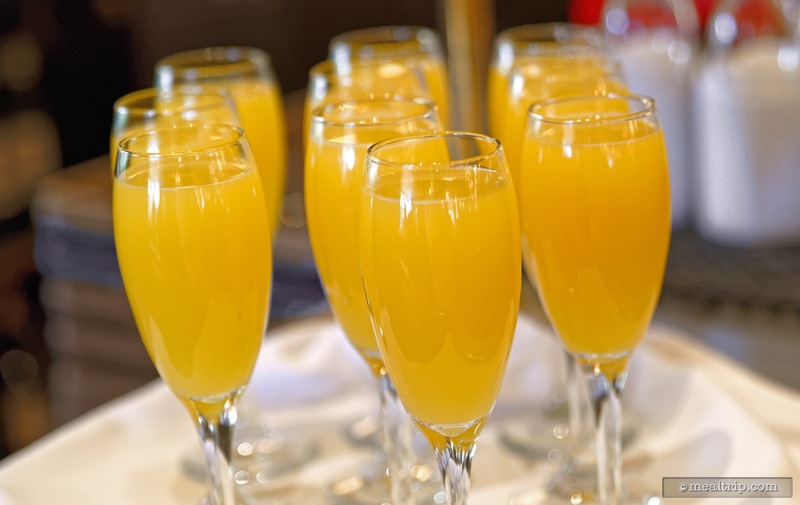 Beverages include Mimosas that are made table-side along with various coffee, tea, and juice offerings (I'm sure that sodas are available as well, but the Mimosas are the real stars here). All cast members are dressed in their finest attire, and while the Parisian Breakfast is a bit more casual than say, dinner... there's always a hint of fine French formality in the air. The price, dates, and items available do change a bit from year to year, but stay pretty close to the description above. 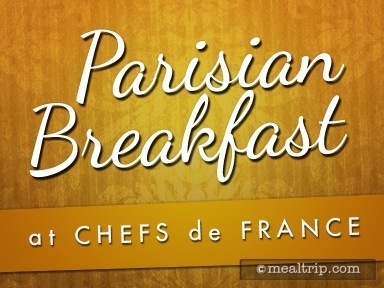 The Parisian Breakfast at Epcot's Chefs de France has been a long standing event during the Food and Wine Festival. 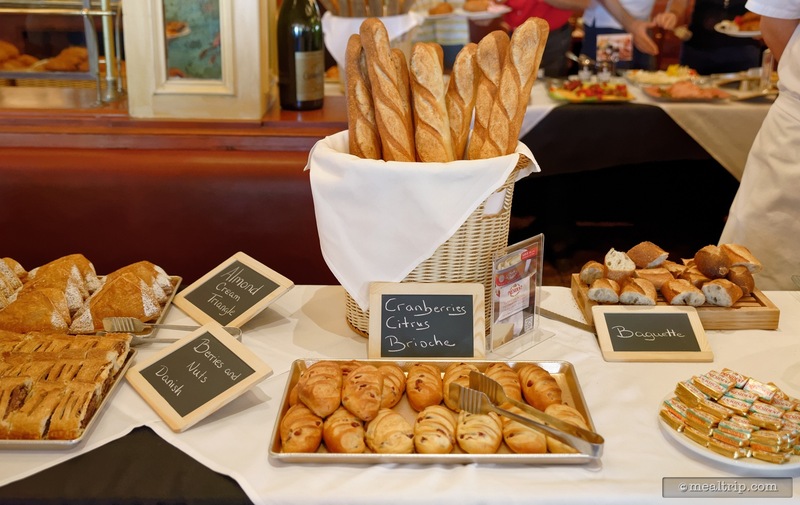 It is one of the least expensive "special events" that you can book, and it has been a really good value as well… especially if you like pastries and mimosas. Taking place only one morning per week (and only during the festival), guests gain special access to the Chefs de France restaurant, which is normally only open for lunch and dinner. It's worth noting that the France Pavilion (outdoor space) is not completely empty during this period as Les Halles Boulangerie & Patisserie (the pastry shop at the back of the pavilion) does open for "breakfast" in and around the same time that the Parisian Breakfast begins. The seating is considered "banquet style" which usually means that if you are a party of one, two, or three… you will most likely be joined by another party at the four person tables. There are a few two-person tables, but there are no guarantees. I went alone last year, and was assigned to the "solo traveler table", a large six person table, filled with guests who went by themselves. Once everyone starts drinking, it's all good. Each table is assigned a waiter or waitress who is mostly responsible for assisting with your beverages and clearing plates away. Most of the servers are from France… and they are happy to talk about their homeland, or answer any questions you have about France. In fact, it actually makes for a great ice breaker… with French wait staff, you get out of them, what you put into them… so don't forget to smile and take an interest! They'll treat you better than other tables that don't care. Mimosas are the featured beverage here. The sparkling wine and orange juice combination is a great compliment to the various pastries, meats and cheeses that are being offered. I'm sure coffee, tea, orange juice (by itself), and possibly sodas are available as well… but it's all about the Mimosas. For those that have been wondering, (up to and including the 2015 festival), you could, in fact, get refills on the Mimosas… for no additional fee. That might change in the future, but I hope not. That's one of the slightly opulent things that make this event so much fun. After the beverages are delivered to your table, everything else is up to you. The food is presented buffet-style (so it's all you care to eat) and I think the flow is quite nice actually. The restaurant is not set up to "do" buffets for lunch or dinner, so they have converted one of the interior dining areas into a make-shift buffet for just this event. The food stations are duplicated on both sides of the center column (so the same things are available on both sides)... and there really is no "line" per-say. You can walk up to any open table, grab a few things, and then go back for more! Occasionally lines do form around certain tables, but I think that's mostly because certain items are very popular and need to be refreshed more than others. 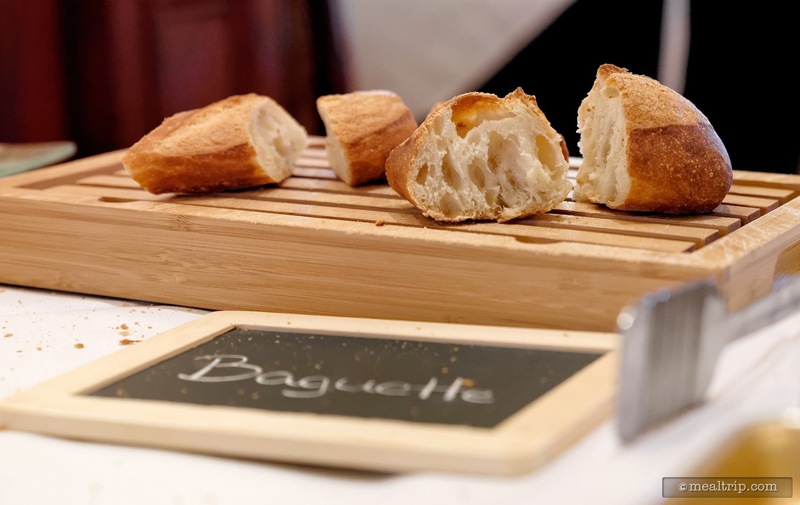 Items such as the Tomato Cheese Tartine and Croque Monsieur are selected often, and it takes a few minutes for a new tray to be delivered and set in place. Even just those couple of minutes can cause a back-up here and there. My suggestion… wait a few minutes and then go back. There's ample time at the Parisian Breakfast to sample everything, so unless you have somewhere to go, sit back and enjoy the ambience. There are too many pastries to mention (and they do change a bit from year to year) but all the offerings are made fresh, on-site, in a bakery that's just a few feet away. If you can eat bread, this is about as good as it gets. 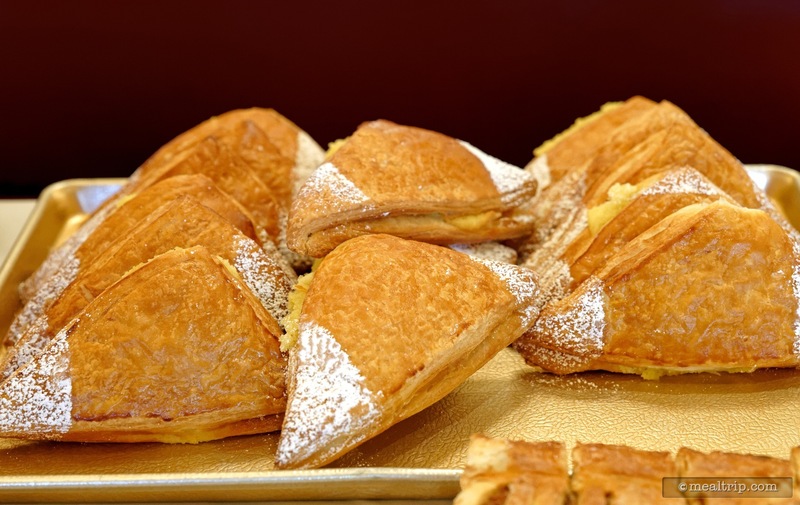 There is usually a plain and chocolate chip Croissant, a few Danish options, and a couple of specialty pastries like an Almond Cream Triangle and Cranberries Citrus Brioche. 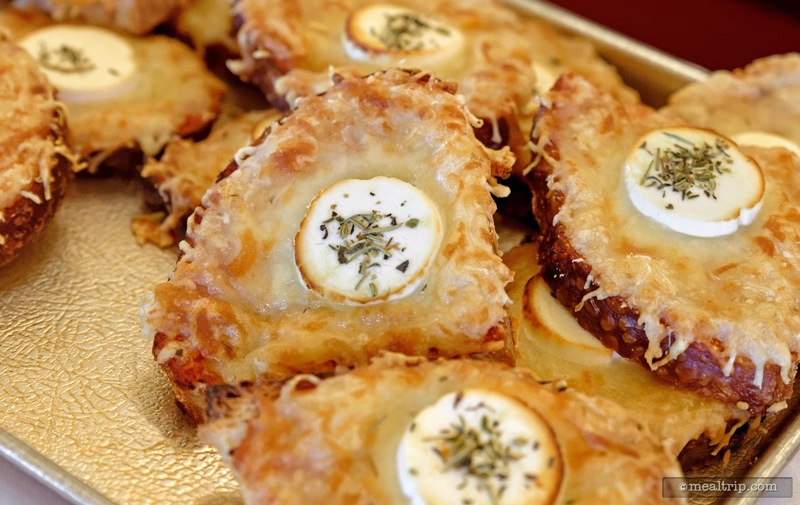 The savory items mentioned above (Tomato Cheese Tartine and Croque Monsieur) are also very popular. 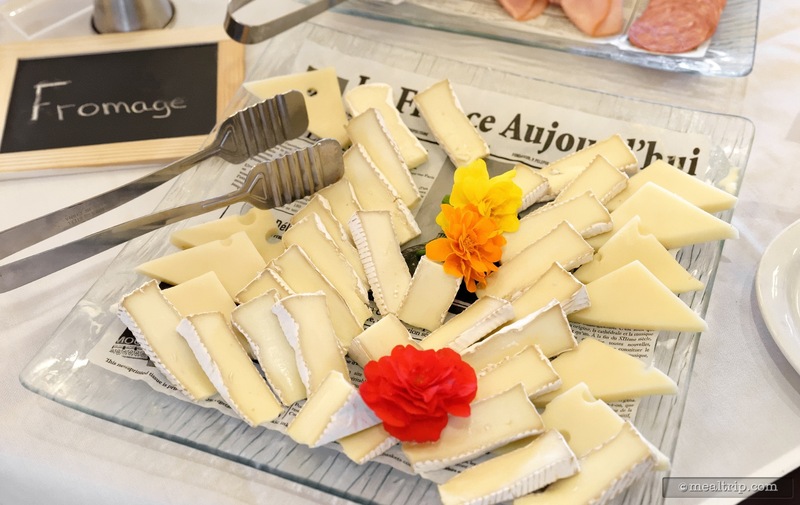 A basic, but fresh, Baguette is available, and is a great way to sample the French-made Bonne Maman Preserves and Spreads that are available. In 2015, there were three preserves… Wild Blueberry, Apricot, and Strawberry Reserve, along with two spreads… Purple Fig and Black Cherry. 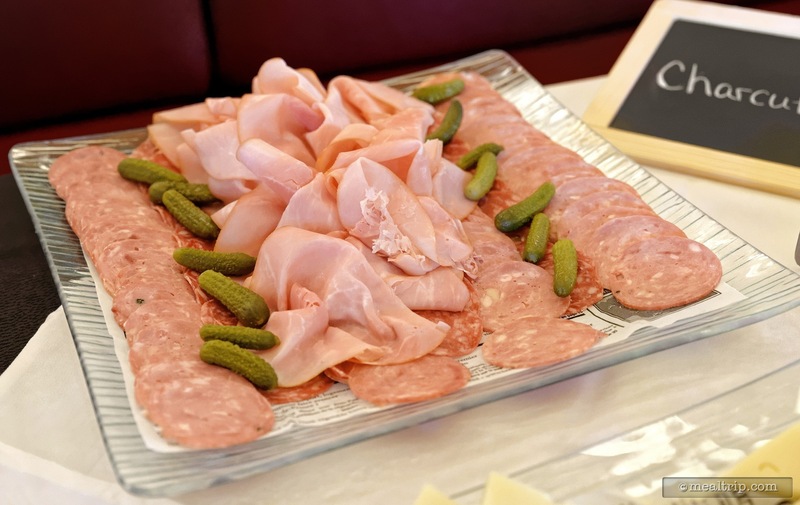 A Fromage Selection Platter is on the table with two or three cheeses to sample, a Charcuterie Selection Platter with two or three meats and Cornichon Pickles, along with a Fresh Fruit Selection Platter that included various sliced cantaloupe, grapes and blueberries. 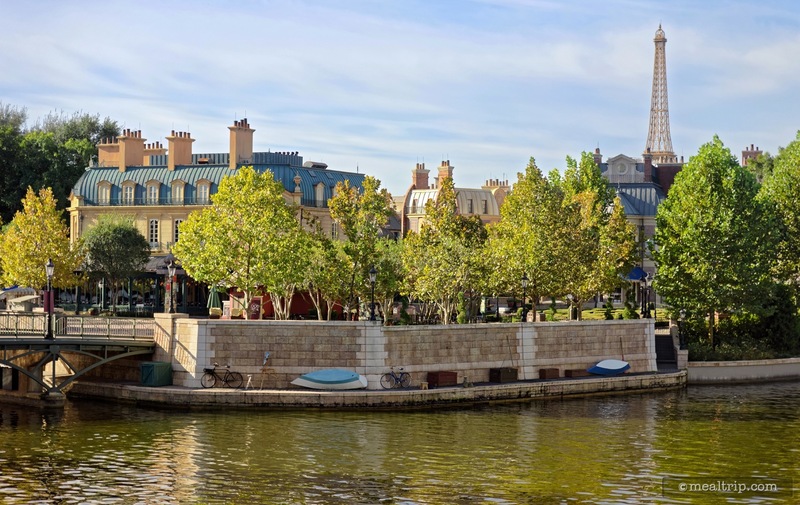 There really is no "educational" component to the Parisian Breakfast as there is with some of the Food and Wine Festival special events, but that's not a bad thing. I'm not really a morning person, and once I get a couple of Mimosas going… I'm not sure that I would remember much of the information anyway. I'm also not really a big "morning eater" so while you can stuff yourself full of all kinds of fresh, French, buttery, sweet and savory pastry goodness… it is worth pointing out that you can't order a side omelet or a slab of bacon. This is not a "hardy western breakfast" with a menu and there are no "characters" walking around… there aren't supposed to be… this is what it is… a light French breakfast. If you're looking for those other things... just about every other breakfast location on property will give you a hearty "American" breakfast. 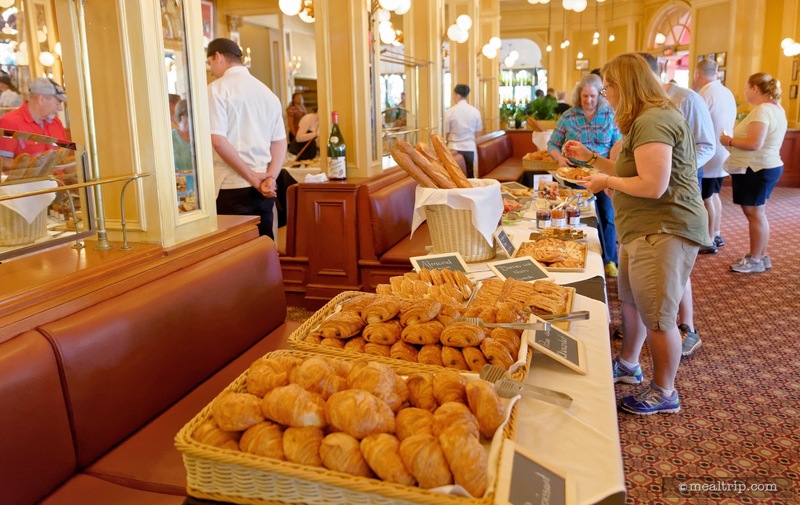 What the Parisian Breakfast does offer, is an opportunity to sample some of the freshest pastries that you will find on Disney property, in a relaxing setting, with a Mimosa in hand. I can't think of a better way to start the day… or to kick off a week of Food and Wine fun! The event gets a high recommendation from me! If you're interested in attending… don't wait forever to book this one. It is extremely popular and often gets filled to capacity months before Food and Wine begins.